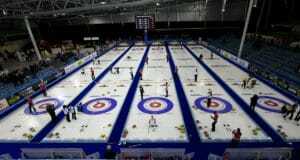 The 2017 Canadian Mixed Doubles Curling Championship gets underway Wednesday in the Nutana Curling Club at Saskatoon. The country’s best mixed doubles curling teams will be in Saskatoon for the 2017 Canadian championship, beginning Wednesday. Olympic gold-medallists, world champions, Scotties and Tim Hortons Brier winners are competing in the five-day event, which is raising excitement levels for mixed doubles making its debut as a medal sport at the 2018 Winter Olympics in PyeongChang, South Korea. Thirty-two teams, seeded and divided into four Pools, will first play a round robin within their pool. The pool winners plus the next best eight teams based on w-l records regardless of pool then advance to the championship round. For the first time, CBC Sports will be offering live streaming of the weekend games. You can watch all the weekend action starting Saturday at 8:30 a.m. (all times CST) at cbcsports.ca or via the CBC Sports app for iOS and Android. For the playoffs, the four pool winners will be seeded and receive byes to the quarter-finals on Sunday, April 9, at 9 a.m., while the eight other teams battle at 8 p.m. on Saturday to determine the other four quarter-finalists. The quarter-final winners meet in semifinals Sunday at Noon, with the two winners advancing the final at 3 p.m. The winning team will not only represent Canada at the 2017 World Mixed Doubles Championship, April 22-29 at Lethbridge, Alta. (held in conjunction with the World Seniors) but also earns $5,100 for the win. Pool A includes the top-seeded pair of Rachel Homan and John Morris. Homan, a three-time Scotties winner, recently skipped Canada to a gold medal in an undefeated record-setting performance at the CPT World Women’s in Beijing. Morris is a three-time Tim Hortons Brier champion, one-time world champion and 2010 Olympic gold medallist. Also in Pool A are Marliese Kasner and Dustin Kalthoff, third-place finishers in last year’s Canadian Mixed Doubles, Kim and Wayne Tuck, the 2014 Canadian Mixed Doubles champions and 2014 Olympic gold medallist Jill Officer and two-time Brier winner Pat Simmons. Kasner and Kalthoff represented Canada at the 2016 World Mixed Doubles Championship in Sweden and placed fifth, and have already qualified for the 2018 Olympic Trials. Pool B is headed by Joanne Courtney and Reid Carruthers. Courtney played second for Homan when winning the World Women’s, while Carruthers won the 2011 Tim Hortons Brier and Ford Worlds as second for Jeff Stoughton and skipped his team to victory in the 2016 Home Hardware Canada Cup. Pool B also includes the team of Kaitlyn Lawes and Ryan Fry, both 2014 Olympic gold-medallists when playing third for Jennifer Jones and Brad Jacobs, respectively. 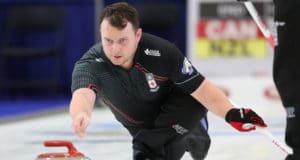 Brendan Bottcher, the 2012 Canadian and world junior champion who most recently skipped Alberta in the 2017 Tim Hortons Brier, is paired with Dana Ferguson, while 2004 Brier winner Mark Dacey teams with Jennifer Baxter. Pool C includes Lisa Weagle (Homan’s lead), who is paired with John Epping; 2016 Scotties champ Chelsea Carey, paired with Colin Hodgson, and Tim Hortons Brier veteran Jim Cotter, who will team with daughter Jaelyn, as he did last year. Finally, Pool D is headed by a couple of famous husband and wife tandems: five-time Scotties, one-time world and 2014 Olympic champion Jennifer Jones and three-time Brier and world champion Brent Laing and 2014 Olympic gold medallist Dawn McEwen and Mike McEwen, bronze-medallist at the recent Tim Hortons Brier. Kalynn Virtue and Charley Thomas, the 2015 Canadian Mixed Doubles champs, are the third-seeded team in the pool. Robert Desjardins, the 2013 Mixed Doubles winner, is also competing, this time with daughter Emilie. Virtue and Thomas recently qualified for the Olympic Mixed Doubles Trials by winning the 2017 Gryphin Mixed Doubles Classic in Brantford, Ont. The format for Mixed Doubles is as follows: A team is composed of two players – one male and one female. 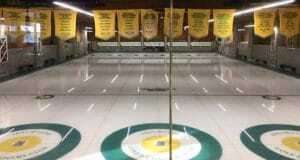 The scoring shall be the same as in regular curling. The “positioned” stones that are placed before the beginning of each end are eligible to be counted in the scoring. Each game is scheduled for eight ends. Each team shall deliver five stones per end. The player delivering the team’s first stone of the end must also deliver the team’s last stone of that end. The other team member shall deliver the team’s second, third and fourth stones for that end. The player delivering the first stone can change from end to end. 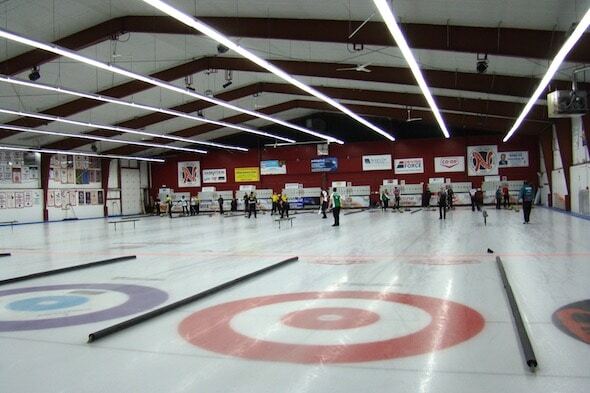 You can find more information mixed doubles curling by CLICKING HERE. The teams will practise on Wednesday (Pool A 9-10:15 a.m.; Pool B 10:15-11:30 a.m.; Pool C 1-2:15 p.m.; Pool D 2:15-3:30 p.m.). The first draw at 5:30 p.m. is for teams in Pools A & B while the second draw at 8:30 p.m. features the teams in Pools C & D. Draws continue Thursday and Friday at 8:30 a.m., 11:30 a.m., 2:30 p.m., 5:30 p.m. and 8:30 p.m. There are two draws on Saturday at 8:30 a.m. and 11:30 a.m., followed by any required tiebreakers prior to the playoffs. Last year’s winner and runner-up, Brett Gallant (with Jocelyn Peterman) and Geoff Walker (with Laura Crocker), respectively, as well as Mark Nichols (who teamed with Homan last year), are not participating in Mixed Doubles this year since they will be playing for Canada skip Brad Gushue in the Ford World Men’s, beginning April 1 at Edmonton, after winning the Tim Hortons Brier at St. John’s last month.